Andrew Hawkeswood has returned to the podium with third place at the fourth round of the Brian Green Property Group New Zealand Rally Championship, Fuchs Rally Gisborne, over the weekend. A string of niggling problems over the past season and a half have seen Hawkeswood frustrated and a spin in the opening stage saw him record only the seventh fastest stage time. Special stage two was the infamous Motu, widely regarded as the most challenging and demanding stage in New Zealand rallying. Well aware of the stage, Hawkeswood and co-driver Mal Peden were able to record the fifth fastest time, putting them in the close fought battle covering third to fifth place. 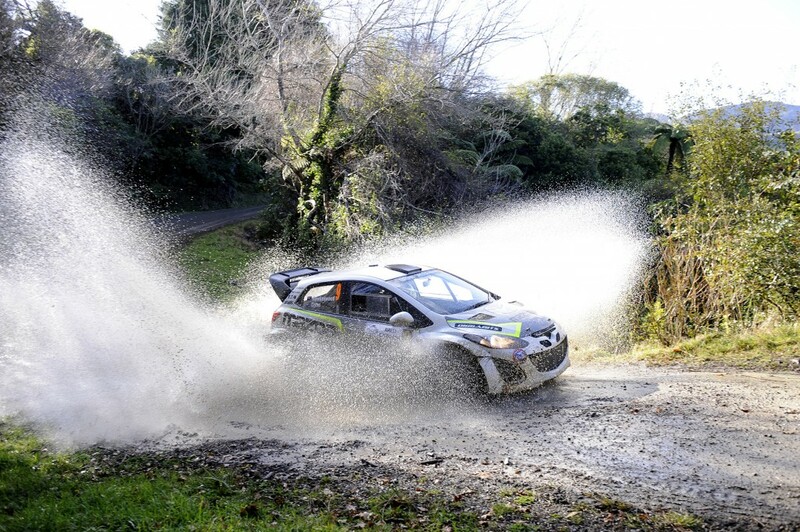 It was a charge through the equally famous Whakarau stage that really kick-started Hawkeswood’s campaign however, powering the Mazda 2 through the stage to the third fastest time, moving him into third place and only 12 second away from second place heading into the final 40km special stage. Hawkeswood attacked the final stage to again record the third fastest time on the final stage, eventually coming up short of the runner up spot by less than 10 seconds. Still, third place sees the best result for the Mazda 2 to date and also sees Hawkeswood return to the NZRC podium for the first time since 2009. Hawkeswood and the Force Motorsport team now turn their attention to the Mahindra Goldrush Rally Coromandel on August 22.